Higher rates: yes. Larger annual revenues: yes. But add to that higher costs and lower profits and you’ve got unhappy loggers in the B.C. Interior. While there are some positive initial signs in the B.C. Interior, digging through the 2018 CFI Contractor Survey results reveals significant discontent among loggers there. Rates may have increased, but so have operational costs, which has led to lower profits and unhappy contractors. The B.C. 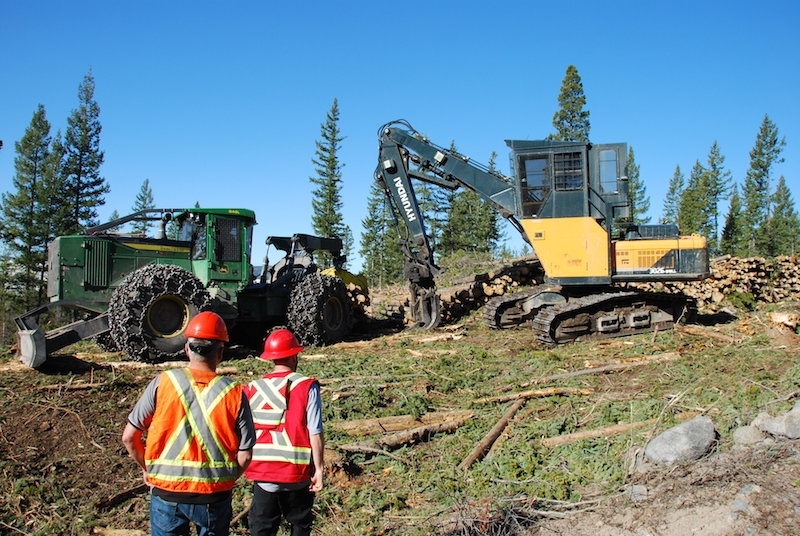 government’s Logging Contractor Sustainability Review made public early this year has likely opened Pandora’s Box, and it remains to be seen what legislators will do about the situation. This survey, taken a month after the report was published, paints a picture of an industry that still sees significant challenges ahead. While logging rates across Canada seem to be stagnating – nearly 50 per cent of contractors report no rate change or a reduced rate compared to five years ago – the B.C. Interior is a bright spot. In 2018 63 per cent of Interior contractors saw some rate increase, which is the same percentage recorded in our 2016 survey. Only Ontario fared better in 2018, with 67 per cent of loggers there reporting a rate increase – however that sample size was too small for a full report. The B.C. Interior also takes the win for the largest percentage of loggers seeing increases of greater than 5 per cent (19% say they’ve increased more than 5% and another 7% report that rates have increased more than 10%). Just over a third of Interior loggers have seen their rates stagnate or decrease, well below the national average. Yet it seems the rate increases are not offsetting costs. Interior contractors are among the most likely to report dismal profits last year. Thirty five per cent of companies say they made no profit in 2017, while another 43 per cent say their profit was 5 per cent or less. Just 20 per cent made 6 per cent or higher. This is a significant slide from our 2016 results, when Interior contractors were among the most profitable, bested only by Alberta. In 2018, only Ontario fared significantly worse than the Interior with 67 per cent of loggers there reporting no profits, and Atlantic Canada fared marginally worse with 36 per cent seeing no profit. It’s unsurprising then to see that Interior contractors are more likely to have seen cost centres increase significantly compared to the national average, particularly when it comes to machinery purchases, parts and service, and fuel costs. Labour, hauling, supervision and insurance costs were also above average, with only increases in workers compensation rates and finance costs slightly below average numbers. Although operator rates in Eastern Canada are on the whole increasing, Western Canada contractors are also upping the incentive, which will likely continue to entice eastern operators to move out west. The B.C. Interior, like all western regions, faces stiff competition for labour, which explains why it is among the top three for earning the most as a machine operator. The estimated average operator wage in the Interior is $34 an hour. Wages are only higher on the Coast where operators earn an average of $37 an hour. The national average is $29. No contractors in the B.C. Interior report paying less than $26 an hour for their operators, and well over half say they pay $30 or more. Wages appear to have increased over the past two years. In the 2016 survey, the largest segment was earning between $26 and $30 an hour. If operators are looking for dental work, the B.C. Interior is the place to be. An overwhelming 96 per cent of contractors there offer some form of benefits to employees, with medical, dental and life insurance the most likely. Interior contractors are also among the most likely to match pension plans and offer paid sick or personal days. The B.C. Interior sits in the middle of the pack among the western regions when it comes to company sizes, revenues and volumes. Interior companies on average produce the second highest volumes in Canada, surpassed only by Alberta. The estimated average volume for a company is 237,000 cubic metres a year. That number dwarfs their coastal neighbours, who produce on average 163,000 cubic metres; however, it is significantly lower than the Alberta average of 398,000. In spite of this, Interior contractors continue to pull in slightly higher annual revenues. The estimated average in the region is $7 million compared to $6.9 million in Alberta. A higher percentage of Interior contractors recorded revenues in the $5 to $10 million range, which offsets fewer reporting revenues over $10 million. When it comes to fleet sizes, Interior loggers come in all shapes and sizes. A healthy percentage fall in each of the middle ranges of 7-10, 11-20, and 21-50 pieces. Only 7 per cent have fleets between 51 and 100 and just 4 per cent have more than 100. While Interior contractors generally employ more operators than the national average, they have the smallest staffs among their Western regional counterparts at an average of 32. Coastal loggers employ 33 people on average, while Alberta skews significantly larger at an average of 55 employees. Atlantic Canada and Quebec, by comparison, sit at around 15. Higher employee numbers will mean greater challenges ahead for contractors when it comes to hiring skilled operators. The B.C. Interior is a region in danger of contractors disappearing. Twenty three per cent of Interior contractors are over 65, which is well above the national average of 12 per cent. Another 18 per cent are 56-65, and another 30 per cent are 46 to 55. This places the average Interior contractor at 54 years old. Add to that the fact that nearly half of them (47%) say they will be out of the industry in five years or less, and you’ve got a recipe for extreme changes to be taking place over the next little while. The picture is nearly the same on the B.C. Coast, Ontario, and Atlantic Canada, all of which is in contrast to the situation in Alberta and Quebec where 60 per cent of contractors fall between the ages of 36 and 55. Even more encouraging for those regions is that at least a quarter of contractors there are under 35. With mass retirement looming, Interior contractors need to be thinking hard about their plan for the business to live on. While more contractors than ever say they have no current succession plan, it seems the Interior is the exception. Just 23 per cent of Interior contractors have no plan for succession, which, when compared to the national average of 40 per cent, is a good sign. Interior loggers are the most likely to expect their children to assume control of the business, at 35 per cent. They also have the highest percentage of respondents who say managers are interested or planning to take over. Loggers in the Interior seem to be of three minds when it comes to their offspring. An impressive 30 per cent have children currently working in the operation and expect them to take over (well above the national average of 11%). However, another 26 per cent say their children are “unlikely” to be involved, and a final 33 per cent say they have no interest in their children being a part of the industry. Despite some rate increases and relatively high volumes and annual revenue, lower than average profit due to high expenses is likely the source of discontent among Interior contractors that led 96 per cent of survey respondents there to rate logging as an important challenge to address over the next three years. The cost of machinery and ability to attract and retain employees are not far behind at 78 per cent of respondents. These survey results show there is more work to be done by all parties – contractors, mills and governments – if we are to continue seeing healthy loggers in the B.C. Interior in five years.